This issue’s article is by Dr Abhijit Das who teaches Vedic Mathematics in India and has many other interests and talents. If you put the number ending with 9 or 9 itself on the left (it should be since it's easier for the eyes to follow) then the number ending with 9 or 9 itself (as the case may be) is the multiplicand. The other number is the multiplier. A complement is the difference of the number from 10. Multiplying with single digit multiplicands can be done like lightning! Say you want to multiply 29 x 6. You calculate this way - the first digit of the multiplicand is multiplied by the multiplier and the product is added to one less than the multiplier. This is the first part of the answer. The second part is the complement of the multiplier. So the calculation would be 2 x 6 is 12 and 12 + 5 is 17 and the complement of 6 is 4; so the answer is 174 and that works for all. 39 x 7 is 21 + 6 which is 27 and the complement is 3; so 273. Now this can be extended to two digits. Say 29 x 15. You do the same thing 2 x 15 is 30 + 13 (in this case two less than 15) The way this is worked out is to see the first number of the multiplier. You subtract one more than the first number. So 15 has a 1, so you subtract 2. The last number is the complement of the last digit of the multiplier. So the calculation is (looking at the sum) 2 x 15 is 30 plus 13 is 43 and then 5. So the answer would be 435. Once you get used to the concept it is very fast. So a sum like 39 x 25 would be calculated like this and fast ... you look at the sum and say, 75 + 22 is 97 and 5 so 975. With practice the two digit ones are also very fast. Concept wise one digit ones are actually the same since in 49 x 4 (4 is 04 so 1 more than 0 is 1) therefore it is one less than 4. In this case 196. This works even for bigger numbers. Say 49 x 112. In this case it will be 4 x112 + 100 (12 less than 112 since 11 is the first number) which is 448 + 100 = 548 and the last number is 8. So the answer is 5488. 9 x 34 = 0 x 34 + 30 is 30 and 6. So the product is 306. So for multiplication of nines go straight for the addition since the first part will always be a zero. So 9 x 45 is 45 + 40/5…855. I have at present extended this concept of 'at sight' multiplication to multiplication with 6, 8 and numbers ending with 8. I think there is lots of scope in this field. Any takers…? A teaching vacancy has become available from September 2002 for a suitably qualified maths teacher for years 7-11, leading to examinations at GCSE. This is a wonderful opportunity for a dedicated teacher to be part of the team at the forefront of Maharishi’s Consciousness-Based Education in Europe. Enjoy the advantages of teaching small, highly motivated classes in a friendly working environment and living in Europe’s largest coherence-creating group in Skelmersdale. The cost of living in this part of the North West is very favourable and the school is situated in the pleasant greenbelt area on the northern outskirts of Skelmersdale, just one mile from the Maharishi Golden Dome. If you think you may be interested, please contact me for further details or an informal discussion. Better still, come and visit the school – you would be most welcome. You can either register on the day or book in advance. from July 1st week; for further enquiries contact the Pune branch of Motilal Banarsidass: Tel # (020) or 95-20-4486190 Also keep looking for Motilal Banarsidass Ads in Mumbai. A reference to Vedic Mathematics in article in The Financial Times, 4th, 5th May elicited at least two letters to the editor in response, including the one below. 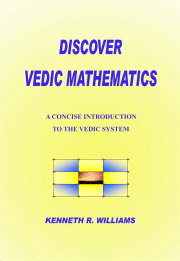 Regarding your recent article "The Saffron Revolution" by Edward Luce I would like to object to the labelling of Vedic Mathematics as of "dubious academic standing". I know this was a quote from an Indian historian rather than the author of the article but the Vedic system of mathematics is without doubt superior to the mathematics 'system' generally taught and used. It is more coherent and integrated as a system, more effective and efficient in practice and easier and more fun to learn. It has been taught in schools in this country for years and a school course, "The Cosmic Calculator" has recently been published that follows the National Curriculum for England and Wales. Many courses have been given in many countries to teachers, students, academics etc. who marvel at the contrast with conventional mathematics. And many academic papers have been written describing and developing this system, which holds huge potential both educationally and in terms of research. The article mentioned in the last newsletter on a business application of the Sutra Anurupye Sunyam Anyat was published in the December 10-23, 2001 issue of Business India, column Accountancy, page 95. If you have sent an email to or between 16th May and 24th May please can you resend if you did not get a reply. If you know of anyone who has tried to subscribe to the newsletter since the last one on 15th April please ask them to resend their message, even if they had a reply. This is due to a computer crash.